I don't post much about work. 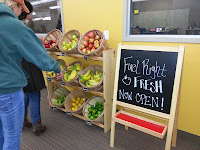 And this post isn't really about work but about food and health. It starts off with Hyland though. This last week Hyland kicked off Good Nutrition Month. The basic goal of the month is to give up drinking soda permanently. Basically the idea is that soda provides two and half donuts worth of sugar with each glass (8oz?) and that by giving it up people would be that much more healthy. 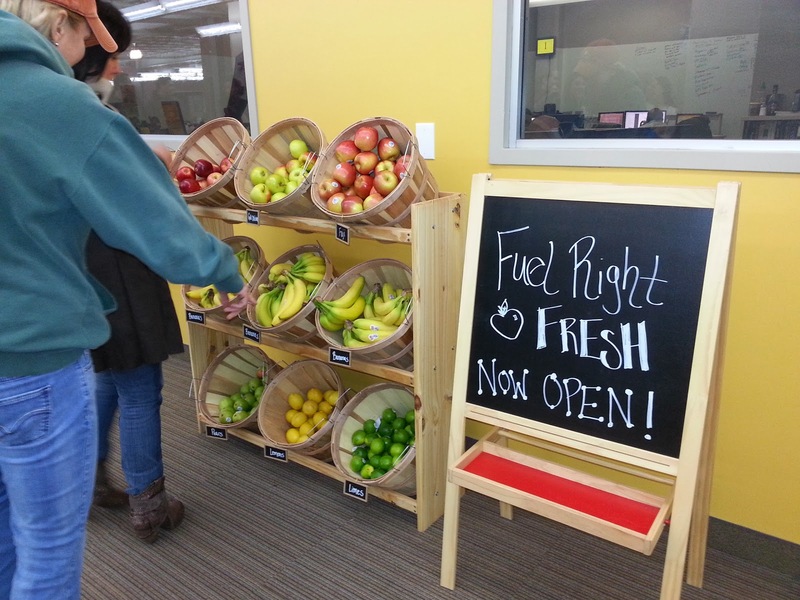 Hyland has won company with the best perks in Northeast Ohio for several years running. As part of that Hyland provides free soda drinks for everyone. There is an irony that this month's wellness program is to get people to voluntarily give up one of the benefits. And this month's program so far has been impressive! 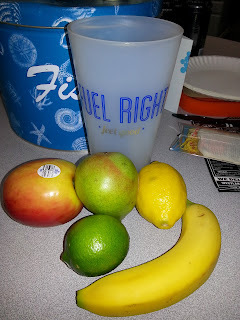 Today, for example, we got free fruit (see picture above) and a cup for drinking water. The picture below was my take today! Tomorrow I get a free lunch! But it really kicked off last week when on Wednesday, we had Kristen Kilpatrick, MS, RD, LD Wellness Manager at the Cleveland Clinic Wellness Center (website, google plus page (+Cleveland Clinic, +Cleveland Clinic Wellness) kick off the month with a presentation. It was a tremendous presentation with an huge amount of information. Probably the most important thing I learned is the effect of sugar and processed food (think white bread) which is a spike in blood sugar levels, the body's corresponding response to process and carry that sugar to the cells with a huge spike in insulation production, resulting it "negative" blood-sugar levels. This deficit causes hunger cravings feeding the cycle. Compared to this is the more controlled increase and decrease of more complex carbs and sugars contained naturally in food like fruit which doesn't have the deficit. I am sure I am late to this party but this was very interesting and informative for me. 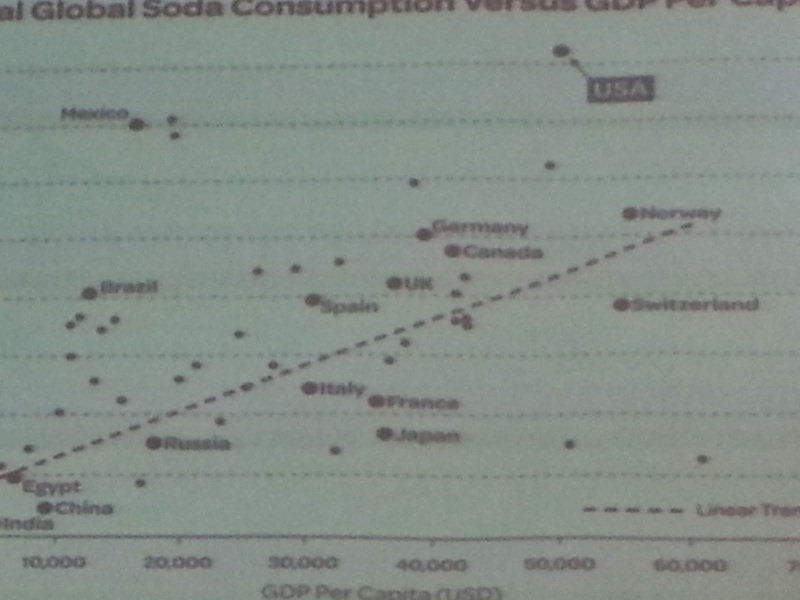 But what particularly what hit me was the data on soda consumption. I tried to grab a picture of the slide. 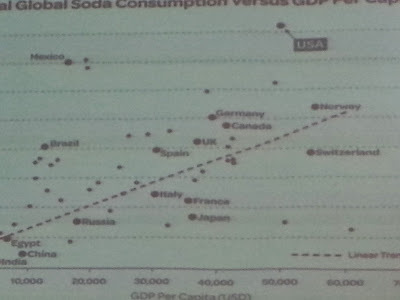 It may be hard to tell, but the US almost doesn't fit on the chart it is so far and away the largest consumer of soda. I wish I had been able to get the axis labels but I think you get the idea. Now, this data didn't actually surprise me in the sense that we all knew consumption was high but the chart does make a very stark point. We drink huge amounts of it way more than any other country by far. It has to stop or we are drinking ourselves to death and not with Alcohol.